Sydney's leading chair hire company with the best chairs at the cheapest prices! We can have your chair quote and chair hire booking finalised within minutes! for hire at the most affordable prices. 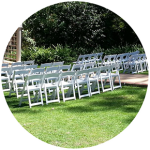 Chair hire Sydney offers a range of quality chairs to cater to events of any kind. Whether you need one or a thousand chairs, we’ll provide you with a suitable package for the day, the week or as long as you need. We do all the cleaning ourselves, meaning you’re guaranteed the highest standard when you receive your order and there’s less work for you at the end. Contact Chair Hire Sydney Today! Why Hire Chairs From Us? We understand that you’re looking for an affordable, reliable and hassle-free package when it comes to seating for your guests. The team from Chair hire Sydney has the edge over the competition in three key areas. We have been providing quality event chair hire to various clients for over 30 years already. We enhance the aesthetics of event venues by providing high-quality chairs for hire. We have the widest selection of indoor and outdoor chairs to give you and your guests a comfortable experience while enjoying your event! 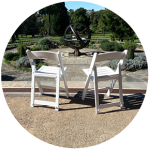 We’ve got everything you need for the perfect indoor or outdoor party chair hire package for your Sydney event. With a focus on the theme of the occasion and the comfort of your guests, come to us for an affordable solution! This beautiful design comes with a cushion to ensure all your guests are as comfortable as possible. As it’s embossed, you won’t risk damaging even the most delicate clothing by sitting on the tiffany chair. Perfect for elegant themes and events, popular with those looking for ceremony chair hire. The series 4400 is a fine choice for special events and classy functions. The design combines comfort, strength and aesthetic, and features an upholstered seat, ventilated back and frame handle. Great quality combined with the convenience of a folding design. Hosting an outdoor event? Wimbledon folding chair hire is a great choice, thanks to the durability and practicality of the design. On top of that, they add a sense of sophistication to casual seating that works for virtually any occasion. Stylish, reinforced with stainless steel, simple to set up and easy to store! Our café bar stools recreate Xavier Pauchard’s 1934 design with a modern, funky twist. Combines flair and practicality with the modern style, and is fashioned from powder-coated steel for strength and durability. Available in silver, suitable for indoor and outdoor settings and finished with a wide seat for comfort. Safe, strong and comfortable—what else do you need? The seat, rear legs and frame of the chair is reinforced by steel and foldable for easy setup and storage. 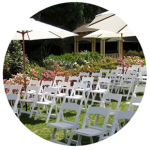 You don’t have to worry about the it bending or your guests getting uncomfortable when you choose Gladiator folding chair hire for your indoor or outdoor event in Sydney. Barrel chairs are one of our most highly demanded products for events of all kinds. The chair is UV stabilised, made from 100% polypropylene and tough enough to carry loads of up to 300kg. Ultra practical, cleanly designed, space efficient and strong—the perfect event chair hire for any occasion. We work with clients all over the Sydney Metro area and beyond. If you’re not sure whether we operate in your area, don’t hesitate to contact us with an enquiry.